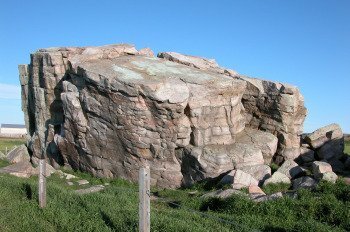 When driving 10 kilometers west of Okotoks, a town located just south of Calgary, on highway 7, you will come upon an interesting sight: a leftover from the times when glacial ice covered the landscape known as "The Big Rock". It really is an amazing bolder. As you get out of your car and walk towards the boulder, it only gets bigger - much bigger. You look up and look beyond the many cracks and faults and realize that this big quartzite rock once travelled on an advancing glacier from Jasper, until it came to its present location. This is just one erratic of a trail stretching from Jasper, Alberta to Montana in the United States called the Foothills Erratics Train. Our children were amazed and couldn't believe that such a big rock would be in the middle of the flat prairie. They are of course used to seeing mountains and wondered where the mountain is that dropped this big boulder! This is a great way to show children what the ice age was like and the power of glacial ice. This erratic even became part of the Blackfoot tribe with a charming story of how the big rock split. You may even be able to see some Aboriginal pictographs which also grace these rocks. Now, for your own safety and the rock's preservation you will have to fight your urge to climb the "Big Rock". This Provincial Historical Site is roped off and to be admired from a distance!